Storing water is often a goal for vineyards and wineries. Whether it be for fire suppression, irrigation or aesthetics. 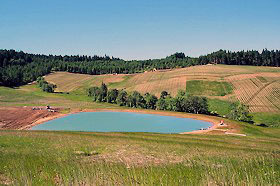 Pihl Excavating has worked with several qualified water rights specialists that are able to provide permitting and design services and we have constructed many reservoirs in a variety of conditions.